Currently, I am a postdoc in Niels Bohr Institute, on a fellowship from the Danish Council for Independent Research. This is my new website. I graduated from Cornell University's Laboratory for Elementary Particle Physics. My main research focus is in scattering amplitudes in Yang-Mills theory, supergravity and string theory. Previously, I studied string inflation and quantum tunneling with gravity. 1. Remark on the Identities of the Gluon Tree Amplitudes. Henry Tye, Yang Zhang. Jul 2010. (hep-th/1007.0597) Phys.Rev.D82:087702,2010. 2. Dual Identities inside the Gluon and the Graviton Scattering Amplitudes. S.H. Henry Tye, Yang Zhang. Mar 2010. (hep-th/1003.1732) JHEP 1006:071,2010. 3. Multi-field Inflation with a Random Potential. S.-H.Henry Tye, Jiajun Xu, Yang Zhang. Dec 2008. (hep-th/0812.1944) JCAP 0904:018,2009. 4. Coleman-de Luccia Tunneling and the Gibbons-Hawking Temperature. S.-H. Henry Tye, Daniel Wohns, Yang Zhang, Nov 2008. (hep-th/0811.3753) Int.J.Mod.Phys.A25:1019-1060,2010. We also found the physical origin of the new-discovered quadratic relation for Yang-Mills amplitudes. (hep-th/1007.0597). Further work would be focused on the (1) the constraints on Yang-Mills amplitudes from supergravity consistency conditions (2) Grassmannian formalism for super Yang-Mills amplitudes. String theory provides a new generation of inflation models to achieve the naturalness and the consistency with cosmology experiments. String theory usually contains a huge number of moduli fields, of which there may be flat directions for inflation. To illustrate the general features of string inflation, we studied the multiple field inflation with both quantum fluctuation and classical randomness in field space. (hep-th/0812.1944). Quantum tunneling is crucial for phase transitions and the early universe evolution. Beyond the familiar "thin wall" limit, we studied the "thick wall" case analytically of the Coleman-De Luccia tunneling, its relation with Hawking Moss tunneling and the thermal tunneling. (hep-th/0811.3753) We also studied the spacetime singularity in AdS space after quantum tunneling. Yang Zhang developed enthusiasm in science from his childhood. His interest was in chemistry, then mathematics, and finally established in theoretical physics. He received his B.S. in 2005 from the department of modern physics of University of Science and Technology of China. 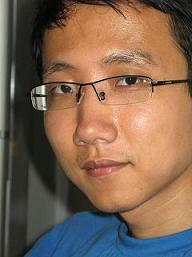 After that, Yang Zhang arrived at Cornell University on 2005 as a Ph.D. student and now he is a Ph.D. candidate.